(1) Technical problem / technical solution: The patent application’s narrative should not focus on the business problem that the invention solves (such as allowing a financial transaction to be completed). Instead, the narrative should focus on the technical problem, as well as the technical solution that the problem solves. Examples of technical solutions include inventions that improve network security, that reduce bandwidth or data storage needs, that improve processing speed, or that help defend against cyberattacks, bots and other malicious systems. accept the longest chain on said slidechain as a valid chain and accept as valid a chain where any voter block stores a voting hash of a voting block which, in turn, stores a voter hash of said any voter block. In response, the applicant argued that the claims covered a solution to the technical problem of preventing the circumvention of anti-privacy measures. Therefore, the applicant also argued that the claims were not directed to a long-prevalent and fundamental practice, nor were they related to commerce or finance. The applicant also amended the claim to include the text printed in bold above, and the applicant argued that even if the claim included an abstract idea the amendments represented significantly more. The Examiner withdrew the Section 101 rejection and allowed the case. (2) Hardware: Patent applications that claim unique hardware configurations, rather than a general purpose computer, may have a better chance of success. accessing funds associated with the address. The USPTO examined this patent application in TC2800 (Semiconductors, Electrical and Optical Systems and Components) and allowed it on first action. (3) Improvements to the underlying technology: Patent applications that expressly claim features that could only happen with blockchain technologies or distributed networks, and which could not occur in the abstract or be implemented by humans alone, may have a better chance of success. While this may end up with a narrower claim, the claim can be more likely to withstand challenges. present the generated one or more authentication questions to the user via a user device for user access into third party secure locations. The USPTO examined this claim in TC2400 and allowed it on first action. modifying the first pending transaction, the second pending transaction, and the third pending transaction based on the determination, the modification comprising removing the third pending transaction. During prosecution the Examiner (in USPTO TC2400) originally rejected the claim as ineligible under Section 101. However, the Examiner also indicated that the claim would be allowable if the applicant amended the claim to include the text that is presented in bold above. The applicant made the amendment, and the USPTO issued the patent. For more examples of patent claims in which the U.S. Court of Appeals for the Federal Circuit, U.S. District courts and the Patent Trial and Appeals Board have upheld patent-eligibility of software inventions, see this post on IP Spotlight. 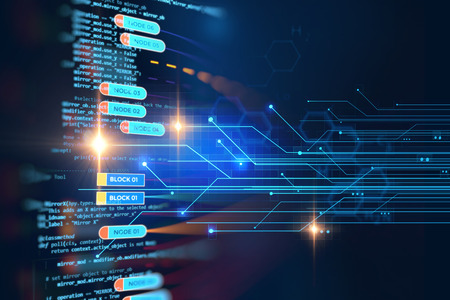 A common feature of many of the patents granted on blockchain technologies is that the applicant sought expedited review under the USPTO’s Track One prioritized examination program. Under this program, for an additional fee of $4000 (less for small entities), the USPTO will issue a final determination (allowance or final rejection) within twelve months. This typically means that the USPTO will issue a first action in less than four months. Although USPTO statistics indicate that the allowance rate is just under 50% for cases in Track One, anecdotal evidence indicates that USPTO Examiners are often more willing to working with the applicant early in the process to find allowable subject matter. In addition, cases that are allowed under Track One receive an allowance within an average of six months after filing. An early allowance in the U.S. can help applicants implement a cost-effective global filing strategy in counties that offer a “Patent Prosecution Highway” (PPH) program with the U.S. A common feature of PPH programs is that if a patent application is allowed in one participating country, other countries’ patent offices will more quickly review the application — and often will allow it — based on the allowance in one participating country. Using PPH treatment, cases allowed in the U.S. often can quickly receive allowance in other PPH-participating jurisdictions such as Australia, Israel, South Korea, China, and the United Kingdom. Another strategy for getting early allowance of a patent application directed to cybersecurity technologies is to request an interview with the USPTO Examiner prior to first action. The USPTO’s First Action Interview Pilot gives applicants a chance to discuss the patent application with the Examiner before the Examiner issues a first formal Office Action. As of January 2018 USPTO statistics indicate that over 29% of cases in the First Action Interview Pilot had a first action that allowed at least some claims, while only 13.4% of standard track cases were allowed on first action. This entry was posted in Business and Transactions, Electronic Communication, Patents and tagged blockchain, blockchain patents, cybersecurity patents, Section 101, software patents; patent-eligibility. Bookmark the permalink.